Update: NYPD identified the victim of this crash as Derrick Belton, 44. Belton died from his injuries on August 21, according to police. 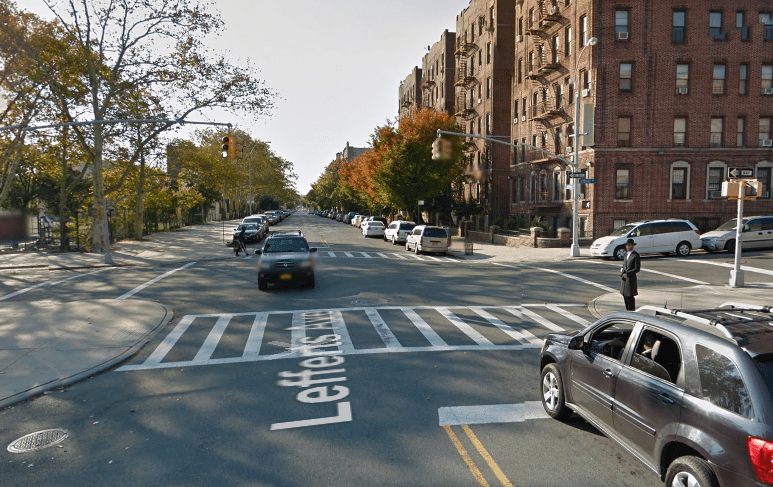 A private garbage truck driver struck and critically injured a 44-year-old cyclist at the intersection of Albany Avenue and Lefferts Avenue in Flatbush last night, highlighting the pervasive public safety risks in the commercial waste carting industry. The victim, whom police did not name, remains in critical condition today, according to NYPD’s public information office. The driver, Steveson Thanus, received “multiple summonses,” though the police spokesperson could not specify the violations. Police arrived at 11:23 p.m. last night to find the victim “laying in the roadway” with “severe head trauma,” the spokesperson said. The garbage hauler was driving a white Mack dump truck registered to La Vega Carting Corporation, located on Highland Boulevard in Cypress Hills, NYPD said. La Vega is a small company with three employees. Co-owner Edwin Rosario told Streetsblog the truck had a broken rear light at the time of the crash. It’s not clear if this contributed to the collision, but if Thanus was backing up, the equipment failure could have been a factor. Police were walking on Albany Avenue early Friday looking for surveillance footage of the crash, according to the Daily News. The News also made sure to note that “it was not immediately clear if the victim was wearing a helmet” — as if that would have prevented bodily harm caused by a gigantic moving vehicle. Private trash carters handle all commercial waste collection in New York, and it’s common for the industry’s drivers to cover sprawling routes in their shifts. Recent reports from the Transform Don’t Trash NYC Coalition [PDF] and the Department of Sanitation [PDF] have called for a restructuring of the industry to create more efficient routes, cutting down on truck mileage and reducing incentives to drive dangerously. Private trash haulers killed six people in New York City between 2010 and 2015, according to crash information compiled by Streetsblog. Of the 21 reported crashes involving private carters between 2010 and 2014, 86 percent caused physical injury or death, according to a safety analysis by Sam Schwartz Engineering. The Transform Don’t Trash report also found widespread vehicle maintenance violations in the industry. A whopping 48 percent of all vehicles were taken out of service due to maintenance concerns in a two-year span, and many drivers reported being forced to drive vehicles with faulty brakes, bad tires, and broken lights. Last night’s crash occurred in the 71st Precinct and in the City Council district represented by Darlene Mealy. If you’d like to voice concerns about traffic safety in the neighborhood to 71st Precinct Commanding Officer Norman Grandstaff, the precinct community council meets again on Thursday, September 15 at 7:30 p.m. at Middle School 61, located at 400 Empire Boulevard. We’ll post updates as more information about the crash becomes available. Sure they did. I don’t even know why I keep reading these stories. My blood pressure spikes help no one, and the murderous daily farce on city streets just continues onward, unabated, regardless of one’s feeling on the issues. NYPD says that the truck hit the cyclist perpendicularly, but also that the cyclist collided with the rear corner of the vehicle? And they also say that he was riding on the sidewalk. No, I’m calling BS on this one right now. I’m so done giving NYPD the benefit of the doubt despite my misgivings, only to be made the fool later when the surveillance video gets found weeks later by the victim’s lawyer or family. Agree. Any adult who has ever ridden on the sidewalk knows that entering the street from a sidewalk is extremely dangerous and has to be done with great caution. Here, we’re talking about a residential neighborhood in the middle of the night (quite), where an inevitably large, noisy garbage truck appears. NYPD is telling us the cyclist exited the sidewalk and hit the rear of the garbage truck under those circumstances? Far more likely, the truck suddenly lurched in reverse onto the sidewalk (in a maneuver we have all seen intended to bring the rear of the truck as close to a dumpster as possible), and knocked the cyclist from the roadway onto the sidewalk before killing him. I’d sooner believe that the “wind force” of the garbage truck drew the cyclist up on the sidewalk. Don’t forget the News piling on with ridiculous victim-blaming. I hope the Police are out there policing and summoning all the Carting trucks, public and private, right away. Instead of immediatelygiving summons to Cyclist’s when one of us get hit. The News has a history of this. I recall a horrific accident in the Slope some years ago where a bicyclist swerved to avoid an opening car door and went under the wheels of a truck. The News made it seem as if she was foolishly trying to shoot between two moving vehicles. I looked for a correction and never saw one. Yes, it seems more likely that the cyclist was on the street and either the truck backed up unexpectedly or the cyclist swerved left or both. From the News pic it looks like the cyclist hit his head on the curb. Is the victim now dead? Headline just says critically injured as of its writing. This is my biggest worry when riding late at night. I typically go up to Prospect Park and then descend along either 15th St. or Lincoln Pl. Lots of garbage trucks running the red lights on the avenues there. (15th/3rd is the worst place, so coming down along 2nd St. is a better option.) Sometimes the lights are perfectly timed and I can do the whole descent at 25mph without stopping, but that’s surely going to be my undoing. On the plus side, my corpse will probably achieve low earth orbit from the impact, which should make for an amusing news story. I’ve moved my usual bike ride to the morning hours because sleepy commuters are way less dangerous than selfish trash haulers. Technically this isn’t Flatbush. It’s either Crown Heights or East Flatbush. I hope the victim will be ok.